It was close for the first few minutes of the game but soon, as they say in nature documentaries, 'There can be only one outcome.' No. 2 ranked Wilsonville blew out the 10th ranked La Salle Prep Falcons 77-44 after a lopsided 32 minutes. "We really looked ready to play," Wilsonville coach Chris Roche said. "They're one of the better teams in the league, and a bunch of seniors, and they were urgent about things. We knew it would be a tough game. I think our guys responded well to that challenge." 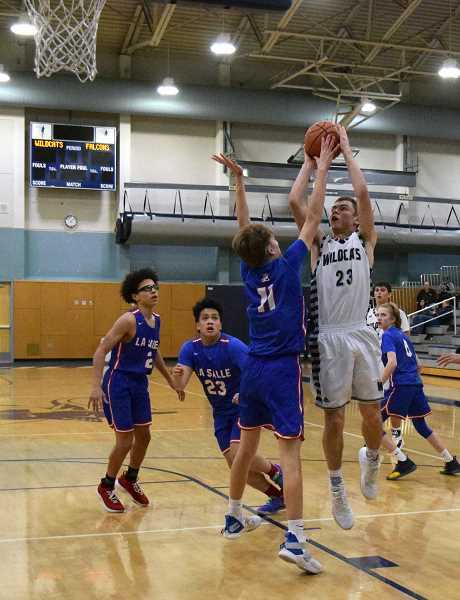 Wilsonville used impeccable ball movement to set up a bevy of assists that gave them, at one point, a 39-point lead late in the fourth quarter. All told the Wildcats had 25 assists on the night, finding the open man in transition, on the outside, or along in the key to get the go ahead bucket. At the end of the first quarter Wilsonville led 19-7, putting together an 8-point run culminating in a pair of baskets from junior Keegan Shivers. Shivers had 12 points on the night, and led the team in both blocks (2) and rebounds (8). In the second quarter Wilsonville continued running up the score, adding 21 points to the tally against just 9 for the Falcons. Multiple athletes got looks at the basket in the second quarter, most notably senior Nolan Thebiay, who had 6 points in the quarter, and 8 overall. La Salle for its part managed to get things going towards the tail end of the second quarter, notching baskets from sophomore Nic Boyd, seniors Jace Norton, and Justin North. Still, the damage was done and Wilsonville led 40-16 at the half. Coming into the third quarter La Salle started a whole host of new faces. Falcons head coach Sean Christensen hoped the youth and bench players would get a spark going for the visiting squad. "Jake (Owens), our sophomore, was fantastic," Christensen said. "He came out there and competed, went to the basket and played super hard. Hopefully some of his energy rubs off on some of the other guys. I sat all of our starters for the majority of the second half, and I thought our guys that came in off the bench did really well. So moving forward that's good if we can rely on them for more momentum, that's great. Maybe it will push the other guys to get a little bit better." Early results were not positive, though. Wilsonville went on an early streak, with junior Dakota Reber doing the heavy lifting in that time. To start the quarter, Reber put together an "and one" play in the paint, and followed it up with an authoritative dunk. Senior Zach Rivers capped the 9-point run with a basket, and an assist courtesy of fellow senior Jack Roche. Reber finished the night as Wilsonville's top scorer with 14 points. Rivers had 10 points and 5 assists, and Roche had 12 points, 7 assists, and 3 steals. La Salle seniors Rudy Massaad, Leo Domingo, and sophomore Ian Simmons all had 2-point baskets in the quarter, and sophomore Kendric Taylor went 1-of-2 from the charity stripe. When the third stanza ended, Wilsonville led 63-25. 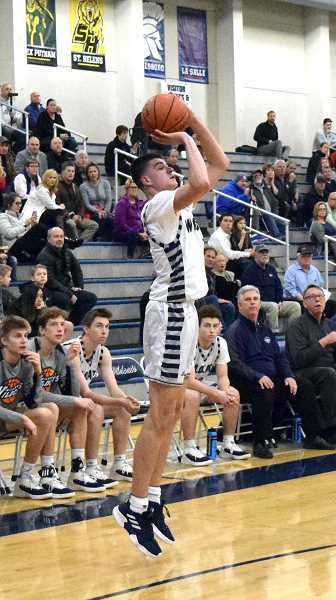 In the fourth quarter, La Salle took charge with four straight points thanks to senior Nolan Grogan on a layup and sophomore Jake Owens at the free throw line. Rivers and fellow senior Sam Westing had points of their own to answer back, and the lead was never in any danger. When Wilsonville coach Chris Roche subbed off his starters and gave the bench players significant playing time, the Falcons were able to find the scoreboard with more frequency, but the damage was already done. Wilsonville walked away with the 77-44 victory. 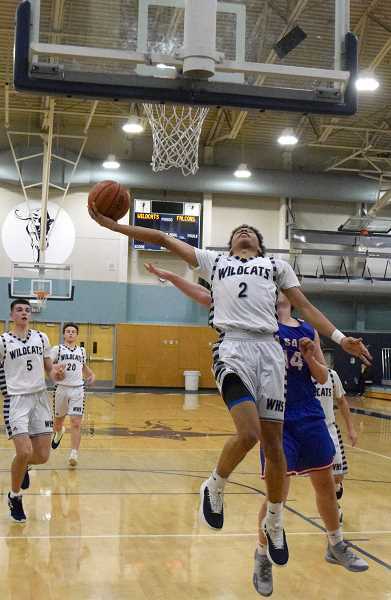 The Wildcats dominated NWOC debutante Scappoose Friday, Jan. 18 in a big way, 103-54. They face off against Milwaukie (4-9) Tuesday, Jan. 22. Despite being dominant thus far in the season, Roche is not looking past any of the in-league competition. "Every year is different and for us, we're just trying to put together a great effort in our next game," Roche said. "That for us is where we're at right now. Try to get better and try to improve. One thing that's tough about games is when you play games that aren't close you aren't tested in certain ways. That's a real challenge for us. We have to embrace that when it happens because it will happen. We have to find a way to win close games too. That's a challenge that's upcoming for us. We're not looking too far ahead."